I am currently enrolled in an Emergency Medical Technician (EMT) class and my text for prehospital care of an injured diver recommends keeping the patient in a left lateral Trendelenburg position if possible. As a DAN Oxygen provider, and a diver trained to the level of Rescue, I was under the impression that the left lateral recumbent and/or the Trendelenburg position were no longer advisable. What do you recommend? The consensus on the ideal posture for an injured diver has changed over the years and, unfortunately, many training materials for emergency medical technicians do not reflect these trends. Studies show that the recovery of brain function is slower in those positioned head-down than those horizontal (Dutka 1990). In summary, according to DAN’s Medical Director, Dr. Richard Moon, there may be benefit in a transient head-down posture for divers with arterial bubbles, but the balance of opinion and data favors a horizontal position. 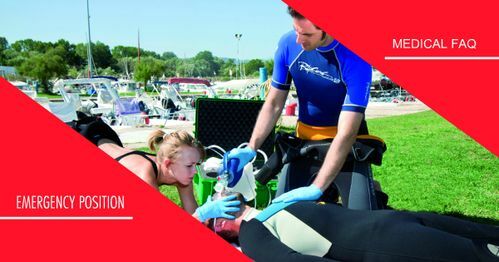 If the diver is unconscious or vomiting, or if the diver's upper airway is compromised, place them laterally recumbent, either left or right, so that the airway can be effectively managed. Divers who are experiencing neurological symptoms of decompression illness must not be allowed to sit up until inside a recompression chamber.